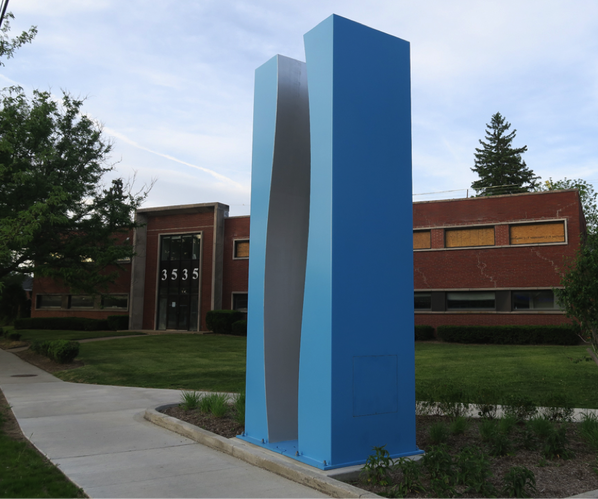 This large sculpture by Shaker High graduate (’89) Steve Manka graces the intersection of Lomond Blvd and Lee Road. Entitled “Cloud Monoliths” this sixteen foot tall sculpture dominates the scene. This monolithic block is carved out in the center to reveal a silver lining and is the artist’s imagined representation of a cross section of a cloud anchored to the ground. 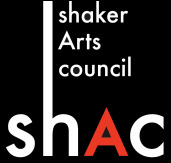 Manka believes, “... our public domain is malleable and needs be shaped with sensibilities that respond sustainability and poetically to the unique realities of each place.” He states, “My public design work is site specific and concept driven. The goal is to find meaningful interactions at each site and then to play with these layers of meaning. Collaboration with residents and other disciplines is crucial and enriching. As a sculptor I hope to yield sustainable and legible public art landscapes that participate m the great craft traditions of building, sometimes pushing techniques when charged with shaping stone, steel, concrete, glass, lighting, plants, images..."
11. Reverse direction on Lee Rd traveling north. 2. Left on Van Aken Boulevard. 3. Left on Onaway, careful crossing the tracks.